Nothing fancy-shmancy about this meal, no-siree, but boy does it manage to put a big smile on my husband’s face each time I make it. He loves it, absolutely loves it. And the kiddos would never turn their noses up at noodles, red sauce and chicken. 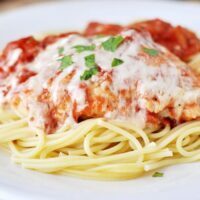 I love classic chicken parmesan and this is simply an easier, skillet-meal take on the concept. My friend Tori (of creamy white chicken chili fame) made a version of this years ago for our family after I had a baby and we fell in love. I’ve made a few changes, adopting ideas here and there from a couple of other chicken parmesan recipes, but the result remains delicious. Tender, golden chicken simmered in a tomato and herb sauce and topped with a creamy concoction of divine, melted cheese (um, that may or may not be the best part of the whole meal). 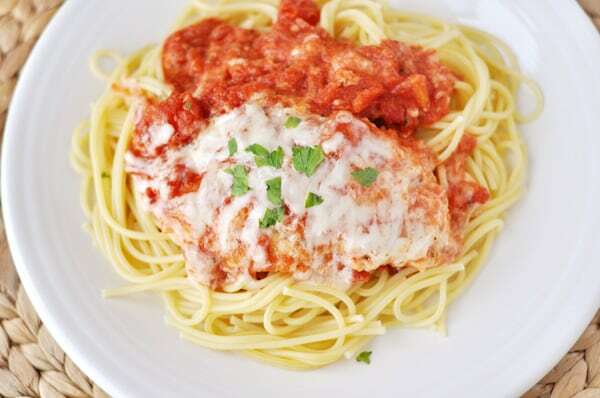 This skillet chicken parmesan never fails to please. And that’s all I really care about after I have slaved over dinner for my fam, let’s be serious. This is definitely a tried-and-true recipe that hits our dinner table often. What’s not to love about a one-skillet meal that comes together quickly and tastes fantastic? I use really thick boneless, skinless chicken breasts to make thinner cutlets (by cutting in half lengthwise) but if you don’t have or can’t find thick chicken breasts, use thinner chicken breasts, keeping on eye on cooking time to make sure they cook all the way through. I made this tonight for my family and it was a hit!! The real success here is that it was NOT prego! I have a BIG prego lover in my house (cough husband) so it’s not often I can get away with a homemade red sauce but he really liked this dish! I would like to make this for a family party. It would be hard to put enough chicken in a skillet at once. After browning in the oil do you how i could put a lager amount in a baking dishes and finish it in the oven? I’m thinking you could just place it in the baking pans and bake at 350 degrees for 10-15 minutes? Just a guess but should be a good starting place. Soooo good! Unbelievably good! My entire family liked it including a picky 8 year old boy, and a one year old. I will definitely make this again. I had debated making the sauce because I figured buying some Newman’s Own (my go to ) would be cheaper, but this was so much better. Thank you Mel! Made this last night and my husband and I really enjoyed it. Definitely a keeper recipe. Thanks for sharing! This sounds so yummy!! I would like to make it tonight but only have tomato sauce. Could I sub the crushed tomatoes for sauce? Elizabeth – you could definitely try that substitution; sometimes the salt amounts are different in tomato products and of course the texture of the finished sauce won’t be the same. Good luck if you try it! Made this for dinner last night and it was awesome! Super easy to put together and the sauce was so flavorful you couldn’t believe how fast it was. The only change I will make next time (and there will be many next times :)) is to do the last cheese melting step under the broiler so the cheese browns. Thanks for sharing Mel! I discovered this on one of your fun collages, and it is delicious and super-easy! Perfect combo in my book! This is a recipe that is always on our menu. It’s quick, flavorful, and my kiddos gobble it up. (Not to mention, it’s one of my favorites too.) Delicious! When I made this, our oldest son snuck in a bite before everyone joined him at the table. He barely emptied his mouth before saying, “This is like Olive Garden!” It was apparently so tasty that he could not restrain himself. About halfway through his plate he said, “Who needs Olive Garden when you can eat this at home!” We all loved this dish and it was amazingly delicious. With such high praise from our teenager, this will be a regular. Our other kids had very clean plates as well. The adults sopped up all the tomatoey sauce with bread. Just made this one for the family tonight. Major crowd pleaser. Thanks! We’ve loved everything off your blog so far and am excited to keep trying new recipes. Keep it up lady! Made this tonight, it was fantastic. We all (including the 4 and 2 year old) licked our plates! The sauce is fantastic and really makes the dish. Thank you for another winner of a recipe!! I decided that I NEEDED to make this last night, but didn’t have provolone, or parmesan, so I just completely left those parts out…and this was still delicious! I’m sure it would have been twice as good if I’d followed the recipe exactly, but it was so good that we didn’t even notice that it was missing all the extra cheese! Soooo good!!! Made this last night and it was DELISH!!!! YUM! Everyone gave it rave reviews, even my picky ones! Made this last week for dinner. It was awesome and soooo easy! That tomato sauce was so flavorful. We have fresh basil growing but I was trying to use up some chopped basil that comes in those tubes in the produce section. Made it even easier. I love those tubes because you can have fresh herb taste all year long. Thanks for the fabulous recipe! I made this and it was awesome! My family loved it. Thank you! We had this for dinner tonight and we loved it. It will definitely be making more appearances at our dinner table. Made this for dinner tonight – and it was a hit! Easy to make and would rival any italian restaurant! Thanks so much for this website! thanks so much, we just had this for dinner and it was easy and delicious! if it makes my family happy, it makes me happy–that’s just a general rule. this is a great take on a classic, mel! Do you think this would freeze well? It sounds delicious, but it will make too much for just me and my two children. Deborah – I actually am not very confident that this meal would freeze well. The better solution would probably be to halve all the ingredients for a smaller outcome. Hi Deborah, I am going to make this tonight and try freezing a piece. Ii thought I would try freezing just the chicken, no sauce. Maybe fry the piece that I will freeze a little longer than the others. I will let you know what the results are in another week or so. If you have tried something similar, I would love to hear what you think. SO yummy! i have never made chicken parm before, but i need to! Oh this sounds delicious! I’ve been wanting to make homemade chicken parm for ages but hate having to fry, then put in the oven, blah blah blah. This sounds so much easier!!! Can’t wait to try it. We LOVE chicken parmesan at our house! 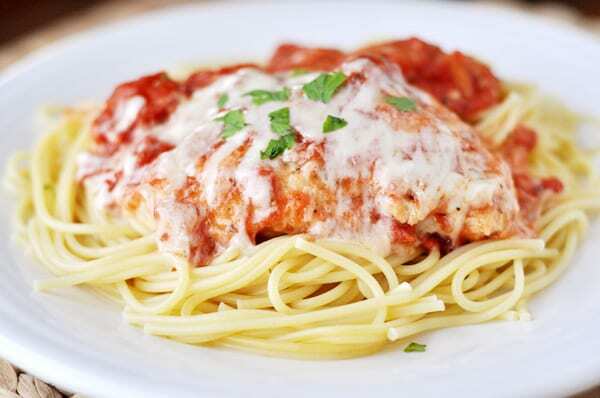 I LOVE chicken parmesan and your recipe looks like one I must try sometime soon. Thanks for sharing!! Oh yum! I have this magazine too and have been eyeing this recipe. Your pictures may have been the last straw – I’m going to have to try this one for sure now! Now I know what we are having for dinner tonight! Thank you! This appears to be a home run.